On the occasion of the International Women’s Day 2019, the theme of which is “Think equal, build smart, innovate for change,” AfricaRice is saluting Mme Aichatou Camara, president of a 55-member women rice processors’ association in Bouaké, Côte d’Ivoire. A strong advocate for innovating for change, particularly in rice processing, Mme Camara, along with her association, is a trailblazer in seizing the benefits of new technologies, such as the new energy-efficient and gender-responsive parboiling system called GEM. Rice parboiling is a process that involves partial boiling of rice in the husk before milling to protect the rice from breaking during milling, preserve nutrition and enhance quality. 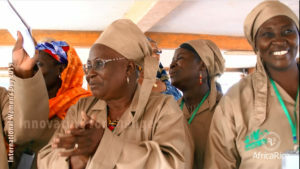 The process is carried out mainly by rural women in Africa. The demand for good quality parboiled rice is high in parts of Africa. But, the traditional parboiling process is laborious, time-consuming and unsafe, producing rice with impurities, broken and burnt grains and undesirable smell. It also requires lots of firewood and water. Recognizing the invaluable contribution of rural women to sustainable development, AfricaRice has developed the GEM technology to reduce the drudgery of women rice processors, like Mme Camara, who are the backbone of food security for their families and communities. The GEM is safer to operate and is equipped with hoists and rails to lift and move the heavy vessels in which the paddy is steamed with ease by women. It helps rural women produce cleaner and higher-quality rice that fetches higher price on the local market, enhancing their economic opportunities to build a better future. GEM is more economical than traditional methods. It enables the women to process large quantities of paddy rice in a relatively short time. It also includes an eco-friendly stove that is fed by a solar-powered fan and runs on rice husk, which is a free and abundant fuel in rice-producing areas. Two years ago, Mme Camara and members of her association underwent a training course on the use of the GEM rice-parboiling system. Empowered with technical knowledge and skills, they have turned rice parboiling into a profitable enterprise.